We design our Commercial steel buildings with the realization of the importance of office space and flexibility in mind. That's why our commercial steel modular buildings and commercial steel buildings can accommodate all of your office space needs. Raise your employees' productivity level by giving them a comfortable work environment. 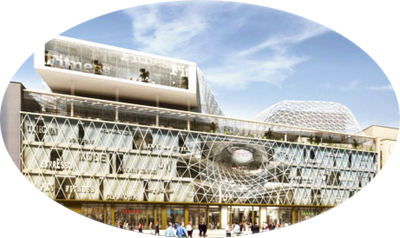 Shopping Centers and Shopping Malls - Another key application in steel structures are shopping centers and malls. Modern structures built for this purpose are no longer the simple tunnel structure reminiscent of the 1970's strip mall. Today, these structures are designed with a keen aspect of aesthetic quality. With a steel structure, you will be able to design your shopping center or mall to fit your design requirements. With millions of dollars in products housed within them, the steel structure will protect your clients' products from fire and water damage. This will help to lower insurance risks and rates for both yourself and your clients who might rent your space. With building codes requiring safety combined with aesthetic quality growing ever more strict, it is important to envelope these considerations into the design of your building. Steel structures offer the obvious advantage in regard to these requirements. Protection of goods, low maintenance costs, safety for visitors, and aesthetic design are leading factors in the design of your steel structure for retail purposes.